With all the recent mega-hype concerning a certain Mr Mayer’s new signature electric guitar, it’s easy to overlook the fact that PRS also offers a range of impressive acoustics. At the top end of the scale, the Private Stock consists of a series of sumptuous, lavish guitars usually played only by either ‘named’ artists, such as Martin Simpson and Tony McManus, or the sufficiently well-heeled, but the more affordable, Chinese-made range of SE guitars has recently been overhauled, with six all-new models. PRS acoustics come in only one of two body shapes; the Angelus (meaning ‘angel’), and the Tonare Grande (meaning ‘thunder’). Of the six new models, three are Angelus cutaways, and three are Tonare Grande non-cutaways, but all are loaded with Fishman GT1 electronics. Two of the range (SE AX20E and SE TX20E) come with traditional ‘X’ bracing, while the remaining four (SE A40E, SE A50E, SE T40E and SE T50E) utilise PRS’ hybrid ‘X’/classical bracing, which combines the best elements of a classical ladder-bracing system with steel-string ‘X’/fan bracing. The physics involved there also permits PRS to better pair resonant tops with stiff, reflective backs and sides. The review model we have on test here is the SE T40E, which pairs a solid Sitka spruce top with layered ovangkol – an African relative of rosewood – back and sides. Tonally speaking, ovangkol has a little more midrange than traditional rosewood, while the top end sits beneath the highs attained by a wood such as maple. As a result of this, it stands to reason that ovangkol’s deep, rich tone is often a favourite with manufacturers of bass guitars. Straight out of the hardcase, the T40E is every inch a PRS. 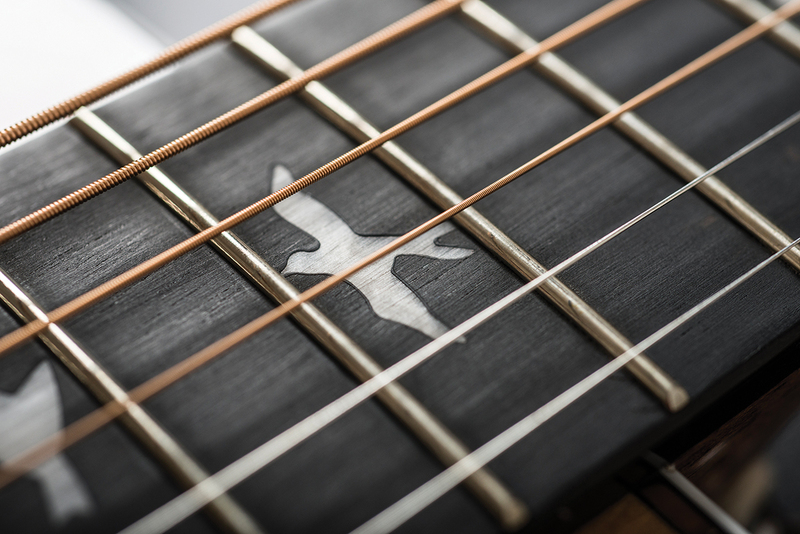 The now ubiquitous PRS headstock sits atop of an ebony fretboard adorned with the company’s signature ‘birds’ inlays. Though famed for unrestrained adornments, this PRS’s ‘bling’ cupboard is pretty bare – just the bird inlays, acrylic body purfling and a modest, matching soundhole rosette. PRS has clearly chosen to focus on keeping the SRP down to make the guitar as attainable as possible. That said, the Sitka-spruce top is a fine selection. As you might detect from the accompanying photography, the soundboard gives evidence of some ‘scarring’. Some, who misunderstand what this actually is, may reject such a guitar due to its perceived ‘defects’. In reality, grain markings have zero impact on tone and performance. Rather, they set each guitar apart, giving it a unique look and appeal. Top and bottom, the T40E is bound with cream-coloured binding that, when set against the rich, dark hue of the ovangkol, creates a striking look. 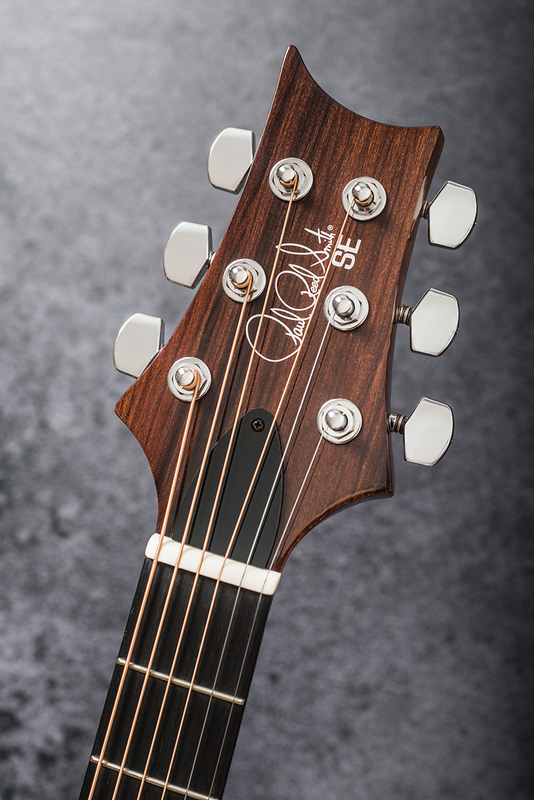 The two-piece mahogany neck is a fairly chunky profile described by PRS as Wide Fat. For players who prefer a slimmer profile, the T40E’s neck will take a little getting used to and might, at first, prove a little taxing. But ‘fat’ necks have increased inherent stability to them, and the additional mass adds to sustain, so adjusting can reap rewards. Hardware comes in the form of 20 medium-sized, flawlessly finished frets and enclosed chrome PRS-designed tuners, to which gauge 0.012 to 0.053 strings are fitted. Onboard electronics are handled by the Fishman GT1 Sonitone – an entry-level system, but a popular and capable one. Tone and volume control ‘wheels’ sit just inside the bass side of the soundhole. The positioning of the controls can make mid-song adjustments tricky, but it does mean that someone hasn’t had to take a jigsaw to the shoulder and make a cut out for a control panel. At the base of the T40E, just below the strap button, is the housing for the nine-volt battery, which will need changing every 100 hours or so. Should that moment arrive while on stage, the battery compartment’s location means changing can take place while standing with a strap. It’s a pet hate of ours when guitars need to be taken off, and the strap removed, just to change a battery. Looking closely at the guitar, it’s hard not to be impressed with the overall presentation and finish. Everything is clean and tidy, and the guitar feels solid and robust. If we were to be hyper-critical, you could accuse the gloss finish of being a little too thick. Particularly with the neck being on the larger side, we would have preferred to see a satin finish to make darting around the fretboard a little easier. That said, the T40E has a genuine feel of being equally at home being gently strummed on the sofa, on stage for an open-mic night, or plugged into an audio interface for home recording duties. With medium pick in hand, we begin with some basic first-position chords. Straight away, the ovangkol shows evidence of why it’s often used in the construction of bass guitars, as mentioned before. The T40E offers a lush, plump bass response – not dissimilar to black walnut, but with a little more in the midrange. The levels of volume and sustain are excellent and, with PRS’s ever-superb factory setup, the T40E is a very enjoyable guitar to play. 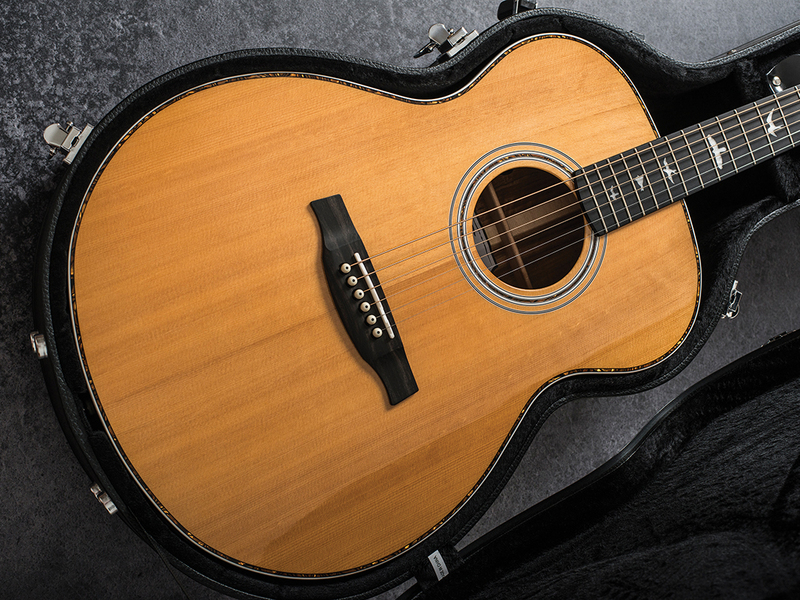 We noticed, too, that the T40E responds particularly well to alternate tunings. Taking the sixth (bottom E) string down a tone to D really opens up a treasure chest of deep overtones and tonal nuances. Plugging the T40E into an acoustic amp with the controls set flat, the T40E performs admirably. The Tone control offers a considerable amount of ‘colour’ and, although not the most versatile pickup system on the market, the Sonitone is more than capable for most duties. For those familiar with the way Paul Reed Smith approaches guitar making, you’ll be aware that his philosophy is all about the instrument being ‘subtractive’, meaning that everything on the guitar isn’t adding more tone, or sustain, it is just subtracting less. In essence, that means that anything that touches the strings has the ability to subtract more sustain or tone from your guitar. In interviews, Mr PRS speaks of putting 6.0 in with the goal of getting 5.8 out. 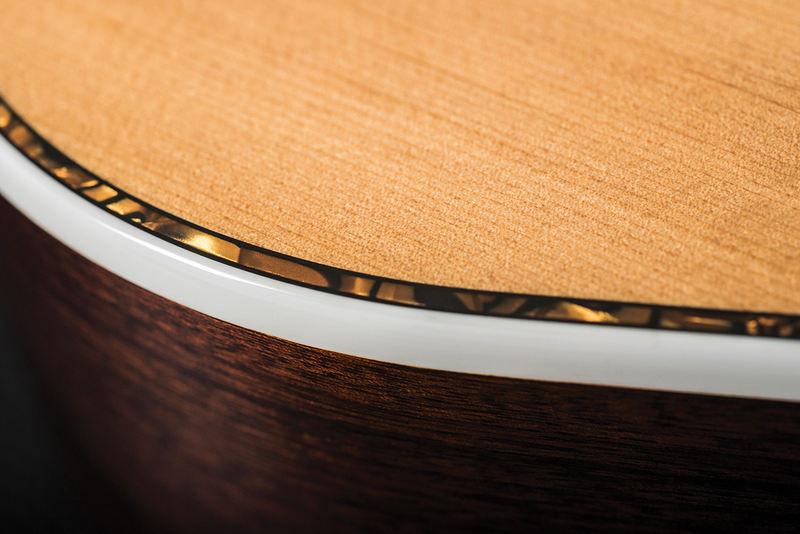 To that end, PRS guitars are fitted with high-quality, tonally responsive materials for the best possible sound. 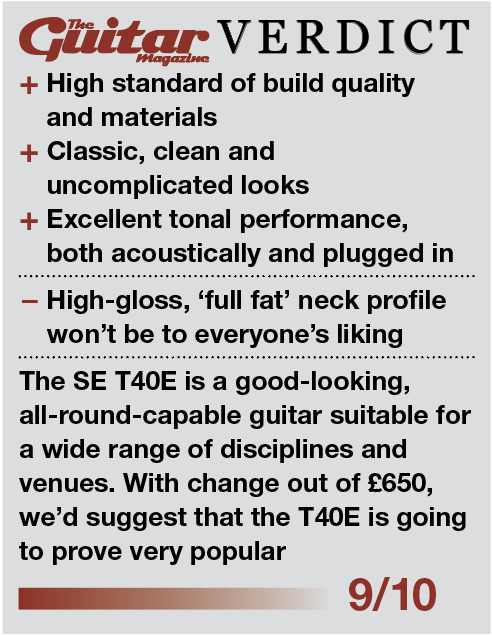 We’d suggest that, even at this modest price point, the SE T40E adheres to that ethos, and is well worth a test drive soon.